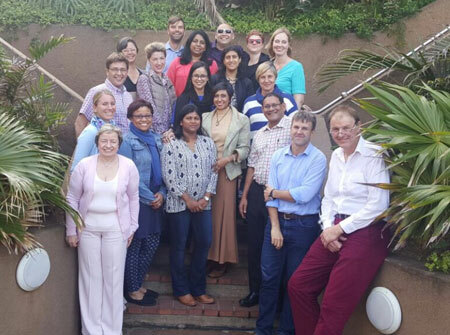 Prof Janet Poole, Dr Ane Buchner, Dr Elmarie Mathews, Dr Nicolene Moonsamy, Dr Rajendra Thejpal, Prof David Reynders, Prof Alan Davidson, Dr Jan du Plessis, Dr Candice Hendricks, Dr Monica Vaithilingum, Prof Mariana Kruger, Dr Jennifer Geel, Dr Biance Rowe, Dr Rema Mathews, Dr Yasmin Goga, Dr Anel van Zyl, Dr Jaques van Heerden, Dr Marc Hendricks and Dr Johani Vermeulen. The first official SACCSG protocol meeting was held at the Salt Rock Hotel from 23-25 September 2016. It was the inaugural meeting that aims to promote co-operative working groups developing national protocols for the treatment of tumours in South African children. It creates a platform for more collaborative research to improve the care of children with cancer in our country.